If you want to skyrocket your sales funnel, it’s time that you learn video marketing! Why? Let’s talk a bit about your marketing sales funnel. A marketing funnel is the path that your customers go through, when they’re planning to make a purchase. This path features different types of interactions that your customers want to have with your brand. All those interactions will shape different moments of your sales funnel. And your way to reach your prospects effectively is with the right video content! So, the key is to know which types of video to use and when to use them. But, another important thing is who these videos are directed to! Do you know what your prospects want? What do they need? It’s crucial that you ask these questions, because having a clear understanding of your prospects will help you deliver video content that is useful for them. You want to catch their attention, and maintain it. And this will be done by helping your prospects, answering their questions and meeting their needs. Getting to know your prospects, means building solid buyer personas. They’re ideal customer models, that will help you trace your prospect’s pain points! Remember, video is an amazing tool. Actually, by including video in a landing page you can increase conversions by 80%. But as there are so many different types of videos, not all of them will work at every moment. So, let’s look at these different moments of your sales funnel! Your sales funnel will break down into three different stages, which are called the awareness stage, consideration stage and decision stage. Your goal is to create the type of video content that will meet your prospects expectations. Creating different types of videos for every different stage, means that your prospects will come to you with different problems and questions. They’ll be craving different interactions with your brand, to satisfy their needs in every one of these stages. Yes! Your Inbound Marketing Strategy! Having a sharp inbound marketing strategy means you will attract your customers in an organic way, by delivering exactly the kind of content they’re looking for. And one of the best types of content for this, is video content. But, remember, as you’ve read before, there are different types of videos and each one will work best in a specific part of the funnel. So let’s review the three stages of it, so we can learn what the best video content for each one is. First things first. 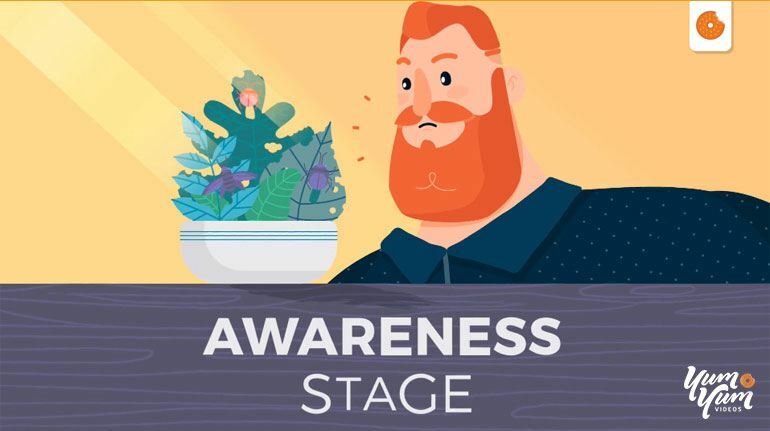 The awareness stage is at the top of the funnel, the moment in which your prospects are entering their paths to the purchase phase. Your prospects are identifying their challenges, the problems they might be facing, and the opportunities they’d like to pursue. They face this by doing research on these problems, and that’s where you should be. It’s not the right time to be just oriented to sales. The best content you can have right now, is content that’s educational. As your prospects become aware of their struggles and they start doing research about it, your goal should be to give them the information they need. Ask yourself, how are your buyers describing the different challenges they’re facing? Are they looking for a specific way to educate themselves about it? If they were to decide to do nothing about it, would there be consequences? Serious consequences? How do they educate themselves about it. The consequences they’ll face if they do nothing. And now it’s your time to deliver the right kind of video content. First, educational videos are obviously your way to go: you want to focus on giving information to your prospects, that will make their lives better and easier by showing the answers they need. Look at this example for an educational video, so you can look a little bit further about what it means to deliver useful and relevant content! Also, branded videos are another type of video content that works amazingly well during this stage. Yes, I’m aware that’s not exactly an educational style of video, but they are great to attract visibility to your products and to your brand. And, of course, this should be another goal for you during this stage: to raise awareness and attract visibility. This is the moment in which your prospects have successfully identified their struggles. Right now, they’re committed to address their problems in an effective way! Welcome to the middle of the funnel, the consideration stage. You’re now aiming to convert your new visitors into leads by informing them about your product. What’s the thing? They’re now considering different options. So, if you want them to choose your solution as the one that can serve them the best, you should help them get informed about it. You want your prospects to choose you, but you want them to make this decision as an informed one. You want them to actually decide that you’re the best. So you need to let them see that you actually understand their struggles, and because of that, you created the best product just for them. Some questions you should be asking yourself: are they looking for different types of solution categories? If so, what are those categories? How do they measure the pros and the cons of every type of solution? And how do they decide what kind of solution works best for their specific problems? Product videos work great for this stage. These are videos that will show your product in action, being used by a person that your prospects can identify with. Live action videos work great, but also as an animated marketing video (to make it more engaging) or as a screencast video, too! 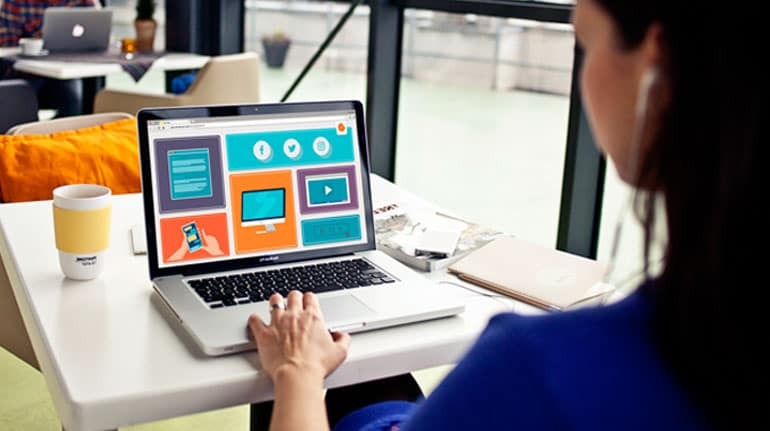 Explainer videos are also great, because you’ll be able to show difficult concepts in a simple way, by using the power of storytelling and animation. There are also many types of explainer videos, so you can choose the one that you like the most! The moment of truth! The bottom of the funnel or the decision stage, is the one in which your prospects will be making the buying decision. It’s time to choose your video content wisely. How are your prospects evaluating their options? What can they find in your product that they like above anything else? On the contrary, what can they find in your product that might become a problem to them? Who needs to be involved in the buying decision? By knowing the last doubts your prospects may have, you’ll learn how to solve them. Let’s also talk about trust. Your buyers need to trust you, and this is one element that will make all the difference in the world. They want to be convinced that your product is the best option for them, and they’ll do it by trusting your product and brand. Building brand trust with video content is not hard. You could use, for example, testimonial videos, which show past clients of your brand talking about their successful experiences with you. Testimonial videos are a great way to give your prospects the final incentive to become customers. This is because you’re showing real people, just like them, who shared their pain points, and found the best solution in your brand. There’s another great type of video that will help you build brand trust, which is an “About Us” video. They let your prospects look at a different side of your brand, a more human and warm side. You will make them feel like they really know you. During the awareness stage, you must focus on being helpful to your prospects.. The most important thing is to offer valuable information! 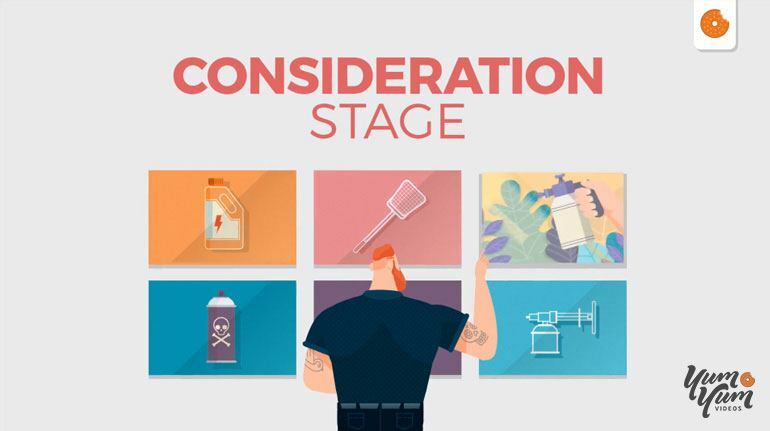 During the consideration stage, the middle of the funnel, it’s time that you show how and why your product is the best option, helping them make a thoughtful decision. And during the last stage, it’s time to build brand trust! Do this with testimonial videos and ‘about us’ videos, that show the human side of your brand.